Learning the secrets of water. 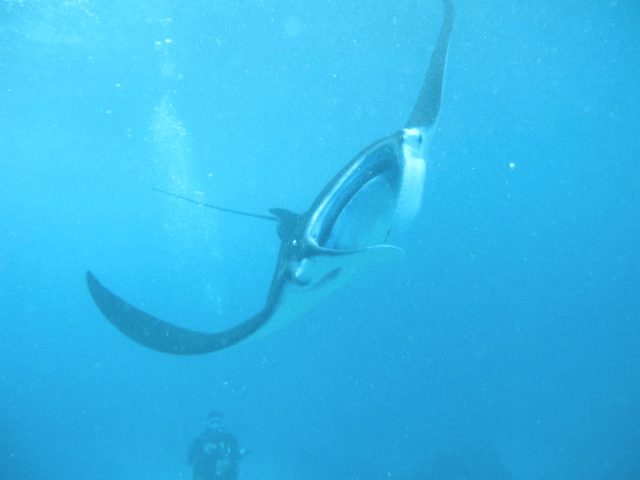 Diving in Nusa Lembongan (Indonesia)… with MANTAS!! Today, March 22 of the year 2093, we the people of the Earth Confederation celebrate the first century of World Water Day, adopted by the United Nations General Assembly on December 22, 1992. We believe we have discovered the way to distort the space-time to bring this letter to the generation of 2015, where the whole humanity faces the challenge of achieving the targets of the Sustainable Development Goals. This is a letter to encourage a transnational reflection to achieve an effectively future management of water policies, especially for the three dimensions of sustainable development: social, economic, and environmental. We hope to raise awareness which will make the 2015 global citizens participate, on a representative and direct basis, in the construction of a water policy at the local, national and international level; a global citizenship movement with a transdisciplinary approach that captures the interconnections between food, health, energy, trade, environment, and water. The International Decade for Action, “Water for Life 2005–2015”, was an attempt to ensure available and sustainable water management. But you, our great-grandparents, grandparents, and parents, ignored the many recommendations of environmentalists and worldwide experts, from Stockholm in 1972, the Club of Rome in 1973, the “Brundtland Commission” and the report Our Common Future in 1987, the Earth Summit in 1992, the Action Program of Barbados in 1994, the Summit for Social Development in Copenhagen in 1995, the Kyoto Protocol in 1997, the Millennium Declaration with the Millennium Development Goals in 2000, Johannesburg 2002, Rio+20 in 2012, among many others. Today, we cry because of your irresponsibility to preserve life and to achieve a sustainable development. We cry because you have failed us with your irrational consumption habits of exploitation and depletion of natural resources. We cry for the water stress we suffer, for your inability to react on time and for all thermal, radioactive, chemical, organic, hydrocarbon, and polychlorinated pollution you have caused in water. All environmental threats we face at the end of the 21st century are the syndrome of a cultural and spiritual disease guided by a neoliberal ideology, whose pathological symptoms are observed in the social exclusion of the poorest with water privatization since the early 1980s, especially in the West. How could you call the current state of ecocide and genocide that ends life on Earth and excludes the poorest “progress”? The main intention of this letter is to get the ownership, management, distribution, and political control of the water to be public. Water is a common good of humanity, and therefore water is a universal human right. In this sense, the Summit of the United Nations General Assembly in September 2015 in New York, where Sustainable Development Goals (SDGs) shall be adopted, represents a unique opportunity to create a global water authority to establish universal standards for sustainable use. Following the sixth goal of the SDGs for 2030, which seeks to ensure available and sustainable water management, the creation of a World Water Tribunal aims to control, evaluate, monitor, and implement water policies at the local, regional, and national scale. The SDGs are a challenge of global governance that need planetary consensus and this requires that all people become aware of the political and economic illusion of unlimited growth. The year 2015 is a turning point to address the geopolitical and geostrategic water challenge. Avoiding conflicts that have occurred in the middle of the twenty-first century requires overcoming the anthropocentric view imposed on diverse common natural goods, which reduce them to commercial, economic goods. The absurd irrationality of social and economic systems that despise the living community for the profit of a minority human elite, converting all source of life into market products, has forced us to migrate to distant planets to safeguard human survival. Lost in the middle of the universe, we cry for the millions of living species that we had to leave in the terrestrial biosphere, having failed to react in time to achieve a sustainable development. The year 2015 is a most paradigmatic crossroad for humanity to decide on the maintenance of life in the future. Water is the critical element for the proliferation of life on Earth, a small planet that gravitates around a peripheral sun of the Milky Way. Water is the most important natural resource and the “mother” of the cells of all living organisms that emerged 3.8 billion years ago. It is a scarce and limited common good on the global and local scale that has allowed the birth and evolution of many human civilizations in nearly all corners of the Mother Earth. The Big History shows that civilizations flourished in favorable areas for agriculture and trade, such as river basins and coastal areas. In addition, the purifier aspect of water is a transcultural element with rites in most religions, such as Christianity, Hinduism, Islam, Taoism, Judaism, Shinto, and the Rastafari movement, among other religions. Water is the transpolitical meeting point of the emerging global citizenship of Earth-Homeland and you have in your hands the future of life, because they are dependent on water to continue their evolution. The year 2015 is the last chance to prevent the collapse of an interdependent planetary civilization and you must continue to join hands to overcome the spiritual poverty that afflicts and hampers you to feel spiritually the rich ecological biodiversity of life in nature. You must act now!